It looks like HP has a relation to the military now. Today, the Palo Alto company announced that it has received a $249 million contract to provide the Department of Defense and other federal agencies with enterprise level cloud computing services. The new initiative will allow the military to consolidate its existing data centers, and the services will be deployed to a number of commercial and government-owned buildings. HP will also provide the military with Performance-Optimized Data Centers (PODs) for quick deployment into tactical situations. 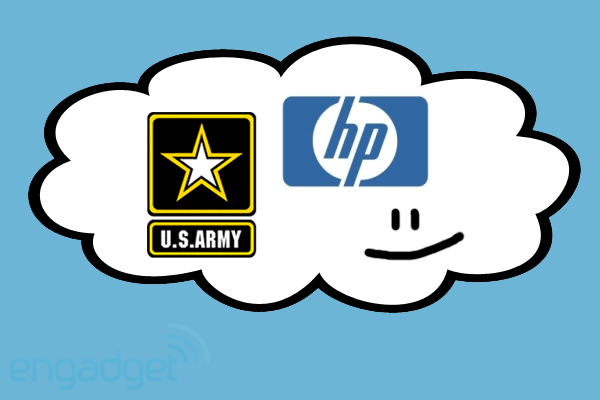 Under the terms of the Army Private Cloud contract, HP will work with ten small businesses and Alabama A&M University to help actualize the private cloud and its requirements. Full press release below. Any thoughts on this? PALO ALTO, Calif., April 03, 2012 HP Enterprise Services today announced it has been selected by the U.S. Army to provide the Department of Defense and other federal agencies with enterprise cloud computing services under the Army Private Cloud contract (APC2). .
With the Department of Defense facing new technical, security and budget challenges, the new contract will help the Army utilize industry capabilities via cloud offerings. The Army will use this contract to acquire specific cloud computing services to consolidate data centers by establishing a secure, cost-effective private cloud. The APC2 is an indefinite delivery/indefinite quantity contract (IDIQ) award with a $249 million ceiling over a one-year base period and four one-year options. The Army divided this contract to acquire enterprise cloud computing services in two suites. HP has been selected to provide services for both suites. The first suite will provide savings by using private cloud computing capacity for commercial or government-owned buildings. The second suite will utilize mobile, containerized data centers for contingency operations or when rapid or temporary cloud computing is needed. For example, HP Performance-Optimized Data Centers (HP PODs) can be quickly deployed into overseas tactical situations or as flexible additions to U.S.-based computing solutions. "A highly flexible and innovative contract, along with reliability and scalability for long-term needs, is important for the Army and our federal clients," said Marilyn Crouther, senior vice president and general manager, U.S. Public Sector, HP Enterprise Services. "As a leader in data center outsourcing with extensive experience with the Army and Department of Defense, HP is uniquely qualified to partner with the Army in achieving its IT objectives in both fixed and deployed environments." Under the terms of APC2, HP will team with world-class partners, including 10 small businesses and Alabama A&M University, to provide a wide range of critical services. Available for both fixed and deployed locations, these services include network connectivity, information assurance, certification and accreditation support, application migration, private cloud operations and maintenance, supply chain risk management, service support and service delivery. More information about HP's services on APC2 can be found at www.hp.com/enterprise/gov/apc2. HP provides the hardware, software, consulting and managed services expertise needed to deliver cloud computing as a viable, cost-effective, flexible and reliable option for government and private sector enterprises. HP provides cloud services that deliver on-demand, secured, enterprise-class applications and processes throughout an organization.